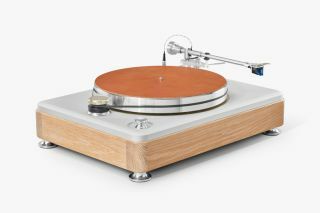 Shinola Runwell is a stylish turntable made from aluminium, steel and wood | What Hi-Fi? The US-based watch and bicycle maker is turning its hand to audio products with an impressive-looking debut. Shinola, a company better known for making bicycles, leather goods and watches, is dipping its toe in the audio waters. The Shinola Runwell is the company's first turntable, and as you'd expect, it has bags of style. Made of aluminium, steel and wood, the deck looks like it would be at home in plush pad, next to an Eames Lounge Chair and Ottoman. Sadly, considering the company's background, there are no leather elements to be found. But it does come in either a natural wood or all-black finish. The deck is made in the company's Detroit factory, with turntable manufacturer VPI Industries, previously responsible for the impressive VPI Prime, lending a hand on the design. In terms of technical details, it's pretty vanilla. It ships with an Ortofon 2M blue phono cartridge, plays records at both 33 and a third and 45rpm, and has an RCA stereo lineout for connecting to an amplifier. As you'd expect, it doesn't come cheap. It costs $2,500 (just shy of £2,000) on the Shinola website. Each of the two finishes is limited to 500 units. It's the first product from the newly-formed Shinola Audio division of the Detroit-based company. So look out for more dapper audio gear soon.